Thanks for stopping by today and for your comments, I really appreciate them. It's been a long time since I've created gate fold cards and when I saw one, I knew that would be the style I'd use. I had so much fun with these and they didn't take long to design. It also felt great to get something done after this week! All the panels on the front have been lifted with foam tape for dimension and you can just see the matching layers peeking through from the inside; those layers were added with super sticky tape. The punched stars were adhered with wet glue. These are gorgeous and well done. Fabulous and so elegant. Thank you for joining us over at the Scribble and Scrap Challenge. Good luck. Very cute card. With all you've had going on this week, I'm impressed with your creativity. Keep it up and we can't wait to see pics of the creative space that comes out of this upheaval. That embossing is fabulous - two great guys cards! I love gate fold cards ... these are fabulous! Thanks so much for joining us at The Sisterhood’s ‘DIES and/or PUNCHES’ challenge and please come back again soon! 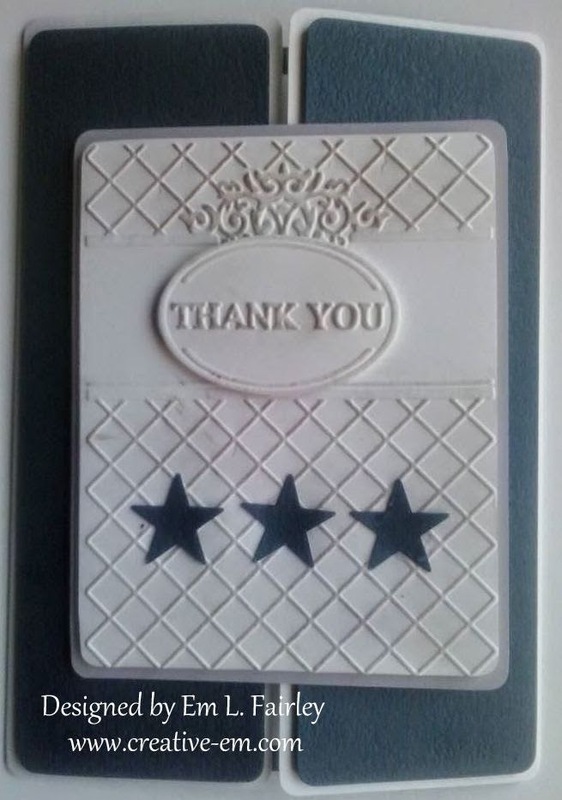 Love your dry embossing goodness! It adds so much to your fabulous Gate Fold design! Thanks so much for playing Simon Says Stamp Wednesday Challenge! 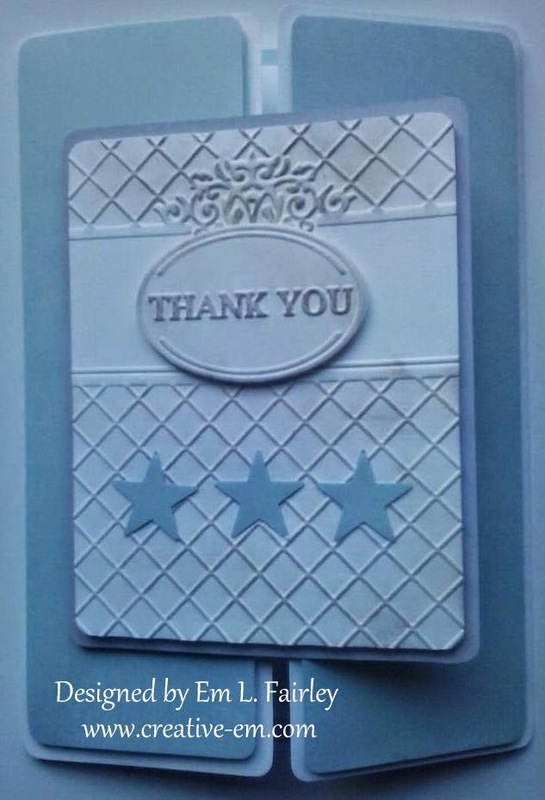 Hi Em, a great card, love the embossing and lovely design. Male cards are hard but you have nailed this one. I love the gate fold. Fab creations. Both look great but I think I prefer the colour scheme of the first this time. Beautiful gate fold card...love those!! Thank you for joining us at "The Sisterhood" for our "Dies/Punches" challenge! !